Every Friday you'll get our pick of all the latest news, intelligence and events available from Windpower Monthly. If you would like full access to the site and subscriber-only bulletins for full coverage of the wind power industry, you can find out more here. The wind energy sector spent a record €65 billion in Europe last year, accounting for more than 60% of all investments in new power assets in 2018, according to new analysis. Turbine manufacturer Senvion has agreed a €100 million loan from its existing lenders, giving the company a lifeline as it navigates its administration process. "Enercon is changing," Hans-Dieter Kettwig, managing director, said at the company's stand at the Hanover Industry Trade Fair, in response to a much smaller German market where the OEM has historically seen much of its business. 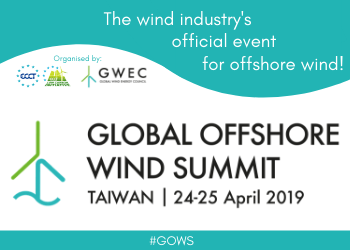 There is huge interest in building up an offshore market in Taiwan by leading industry developers and the government alike - this official industry event for offshore wind will gather all these stakeholders under the same roof to discuss how to best ensure that this market reaches its full potential. GERMANY: The 385MW Arkona offshore wind farm has been officially opened. Located in the Baltic Sea, the 60-turbine asset began supplying electricity to the German grid in September 2018. It became fully operational in early 2019. UK: Lewis Wind Power (LWP) is transferring ownership of the 180MW Uisenis project to the Oppenheim family. It owns the Eishken estate on the Isle of Lewis in the Outer Hebrides, Scotland, where the project is located. The development would require a new interconnector between Lewis and the mainland. UKRAINE: Finance has been secured for the second phase of the 250MW Syvash development. The €107.6m agreement was signed with a syndicate of development banks including Proparco, BSTDB, Finnfund, IFU and NEFCO. Saudi Arabia’s Al Gihaz has acquired a minority stake in the two-phase project, which is being developed by Total Eren and NBT in the Kherson region. The focus is moving beyond pilot and demontration-scale projects. Find out where it's headed here.